Thanks to support from the National Science Foundation, a professor of chemistry at Bates College is bringing four Lewiston High School students to the college to help investigate the biochemistry of a particular category of viruses. Professor T. Glen Lawson and LHS biology teacher Jason Fuller are working together on this project that brings four advanced-placement students to Bates today through June 25. Mentored by two of Lawson’s research students, the young people from LHS will help prepare cloned RNA from the encephalomyocarditis virus (EMCV) for use in experiments examining how the virus’s RNA is replicated. The four are Andrew Boulanger, Tyson Morgan, Sarah Chandonnet and Tracy Bradley. The project is a pilot program that, if successful, Lawson hopes to expand to include 16 AP biology students from LHS. A three-year NSF grant for $265,000, awarded to Lawson in 2002 for his viral research, is funding the project. Lawson says that it’s increasingly common for colleges and universities to support science education in secondary schools. 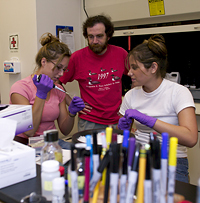 High schools often lack the facilities or resources to bring their science education beyond a certain level, however motivated science teachers may be. “The best way to teach students, both high school and undergraduate, what science is and how it is done is to give them the opportunity to do it with their own hands,” says Lawson. Lawson and his students are involved in an ongoing exploration of the workings of protein destruction in viruses. The specific question that the LHS students will help clarify is whether a particular EMCV protein binds to the genomic RNA as part of the RNA replication process. At the high school, AP biology students are required to do some sort of summer project prior to taking the senior AP biology course, a requirement satisfied by Lawson’s project. The LHS students will present their research to their class in the fall. Lawson, who serves on a grants advisory panel for the NSF, adds that the agency frequently provides funding to support research experiences for undergraduates and high school students and views these experiences as important vehicles for science education.